In generally, printing id cards, you need an ID card printer, An ID card printer is quite expensive for many of small business owner, It usually take more than USD 1300. and after that you will need to buy software for id card designing, printing and membership management, and also, the printer supplies, cards etc. so that the one-time investment usually take up to USD 1500 or even USD 1800! but you might just want to issue dozens of cards for your staffs, or your customers, why do you need to spend 1500 dollar or even more to do this thing? .Oh! Right! You might said that you can outsourcing this thing to third-party, but that means that you will need to share your staffs or customers information, privacy to the third-party, and also it is hard to manage these information, because they can only make cards for you, won’t and can’t providing any data management solution, for example: if you would let some thrid-party to make cards for you, and then you send these cards to your customers for membership purpose. and if some customer use his cards ask for discounts or services, how do you the card he give you is valid? and yes, you need a total solution for ID card printing and membership management and of course it should be at an affordable price. 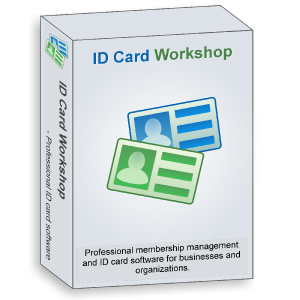 ID Card Workshop is the software designed for these purpose. it combine ID card designing, printing and membership management. and it is a low-costed software, it has two different types of licenses: pay-as-you-go and full license. pay-as-you-go enables you to rent the software month-by-month or quarter by quarter. and the price as low as $14.95 each month.